In flashy campaign art, Iran’s six presidential candidates are pulling at public heartstrings and playing on haunting moments in Iranian history to rally votes. Posters are now plastered across billboards, fences, office blocks and the sides of cars as well as on Facebook, Twitter and Google Plus accounts—some of which are actually banned in Iran. Each candidate has his own buzzwords drawing on his past as a war hero, top adviser to the supreme leader, moderate cleric or peace negotiator. Jalili is a war veteran who lost a leg fighting Iraq in the 1980s—and his posters ooze with sacrifice and nationalism. His slogan, “Resistance is the key to success,” draws on imagery from a war that ended a quarter century ago but still influences politics. 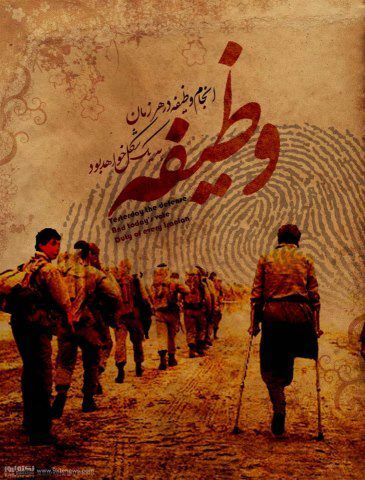 This poster encourages Iranians to fulfill their national duty to vote while recalling their past duty to defend the country. A hardliner, Jalili has run the most ideological campaign of the six candidates. He is currently secretary of the Supreme National Security Council and Iran’s chief nuclear negotiator. Jalili accuses other candidates of being too soft on national security issues. Qalibaf is a “man of action”― and his posters gush with images of him on the job. 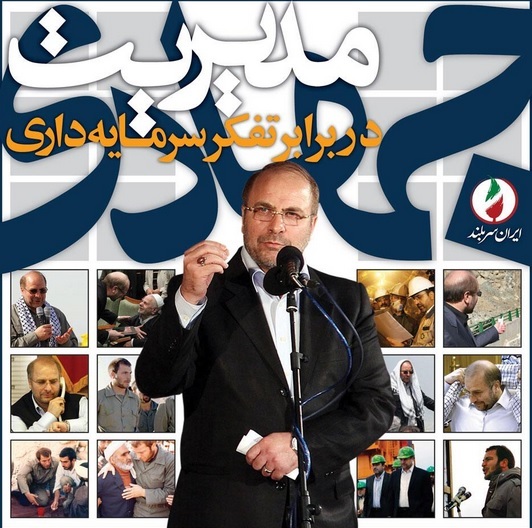 Websites and blogs by the “Lovers of Qalibaf” depict the Tehran mayor overseeing the building of bridges, highways and parks to illustrate his slogan: “Jihadi management versus capitalism.” A pragmatic conservative, Qalibaf balances his image as a manager with security credentials. Four pictures on the left are from his days as a Revolutionary Guard on the Iran-Iraq war front. 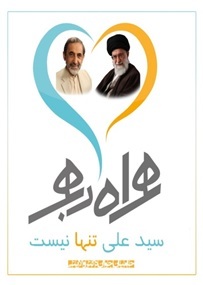 Velayati is the ultimate revolutionary insider ― and his posters flaunt his love-fest with Iran’s ruling clerics. His campaign boasts that the supreme leader “is not alone” in confronting Iran’s challenges. In his video, entitled “My Iran, Oh Fatherland,” Velayati cries as he watches old television footage of Iranians wailing and beating their chests after the death of revolutionary leader Ayatollah Ruhollah Khomeini in 1989. A hardliner, Velayati served as foreign minister from 1989 to 1997 and was then named Khamenei’s chief foreign policy adviser. Rouhani is the only cleric in the race—and his campaign pushes an aura of piety. “A man of faith has come,” this poster pledges. The lone reformist candidate has run on a platform to “replace extremism with moderation.” He promises a “government of prudence and hope” that will work with both conservatives and reformists. But Rouhani also has a unique blend of other assets. He was secretary of the Supreme National Security Council and the top nuclear negotiator from 1989 to 2005. Rezaei is the former Revolutionary Guards Commander—and his posters mix muscle with mystery. 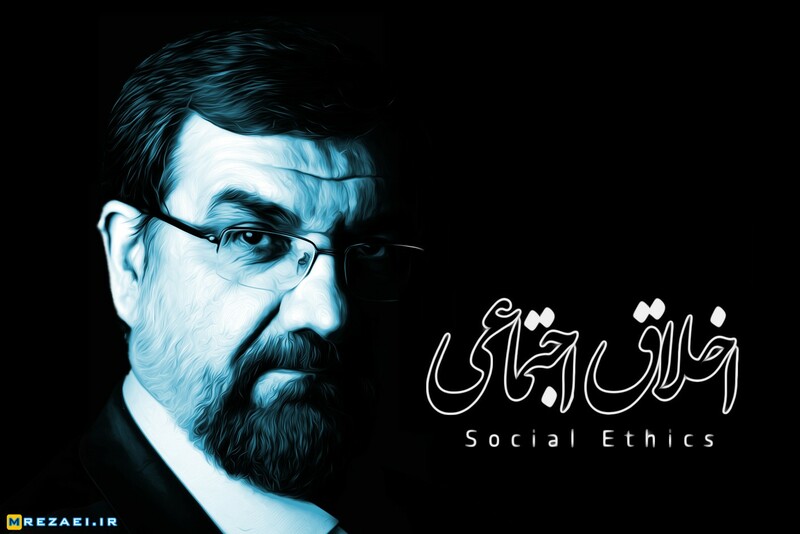 Rezaei’s slogan is “social ethics,” and his campaign centers around themes of the “people’s pain,” especially on the economy. On social media, his videos show him meeting with workers and small shopkeepers in outlying provinces. Rezaei has tried to stake out an independent position by criticizing both the reformist and hardliner camps. 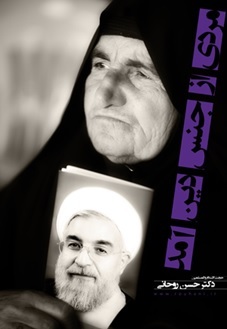 Gharazi is a blunt and outspoken independent ― and his posters exude frustration with Iran’s economic crisis. His slogan is “government against inflation.” Gharazi accuses both reformists and hardline “principlists” of losing control of the economy, claiming that the governments has its “hands in the pocket of the poor” while prices and unemployment increase. Gharazi’s video flaunts his role building the Revolutionary Guards in the 1980s, while his website and Twitter account parade pictures of him as a governor and oil minister. Garrett Nada is a Program Assistant in the Center for Conflict Management at the United States Institute of Peace.